Spring is finally here! Last week marked the first day of Spring and we were blessed with a week full of sun and 70s here in Michigan, it was like summer, gorgeous and perfect for going out and playing! 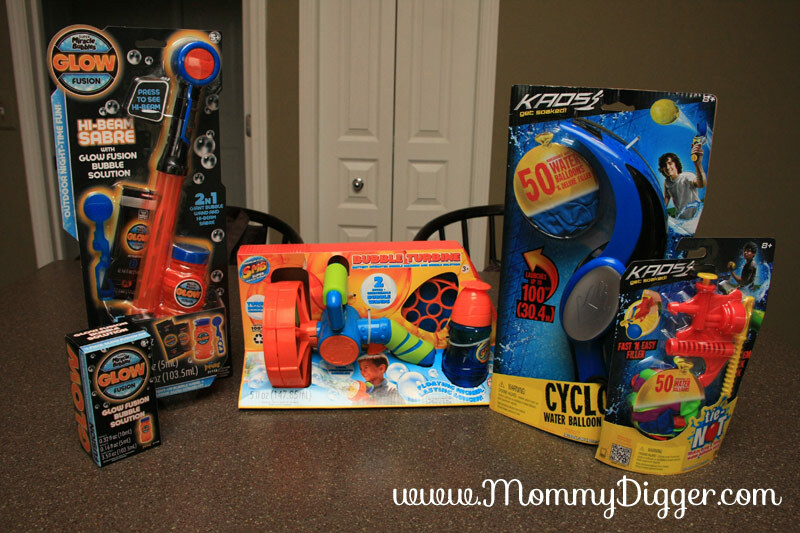 What’s makes for more summer fun than bubbles and water balloons?! This spring Imperial Toy has debuted new toys that will make for hours of summer outdoor fun! We were sent some of the new toys from Imperial Toy for review and were excited to get out and try them! Imperial Toy has LOTS of toys for children of all ages and many fun bubble toys and water balloon toys that are perfect for getting your kids out to play! The first item we played with is the Bubble Turbine. This bubble toy comes with 2 attachments, one for large bubbles and one that blows a bunch of bubbles. Just pour the included bubbles in the tray, dip the turbine, push the trigger and bubbles will come blowing out. We had lots of fun making large bubbles, we even got a few to reach about 2ft big! Daddy Digger and I got in on the fun and had a friendly competition of who could make a larger bubble (psst, I won 🙂 )! We then tried the multiple bubble attachment and that was pretty neat too, loads of bubbles upon bubbles come out and make for lots of bubble chasing fun for Baby Digger. She had a great time chasing them down and popping them! This is a great bubble toy, it was easy enough for a toddler to figure it out and play with but really it’s fun for all ages. When the sun goes down and your kids are still at play, what could be better or cooler than Glow in the Dark Bubbles? Check it out, the Super Miracle® Bubbles Glow Fusion. once you mix in the included activators the bubble solution glows an intense orange color. When the bubbles pop, it leaves you glowing orange (don’t worry it washes off) and makes for some fun bubble blowing nighttime fun. The Glow Fusion bubbles will be great for the summer night parties and camping trips. Glow Fusion Bubbles are available in stores and on www.amazon.com for $8.95 with Free Super Saver Shipping. To amp up the Glow Fusion bubbles there is the Glow Fusion Hi-Beam Sabre. You mix the bubbles with the activators and with the included funnel you pour the bubble solution into the sabre. It has a bubble wand and it also lights up with the push of the button on the handle to create a cool effect to the already glowing bubbles. The Glow Fusion Hi-Beam Sabre is available at stores and online at www.amazon.com for $19.99 with Free Super Saver Shipping. When the even warmer dog days of summer come the neighborhood water fights are sure to come! This summer Imperial Toys has new toys for your arsenal of water balloon fight gear. The KAOS® Tie Not Filler makes filling water balloons so much easier! You attach it to your garden hose and turn on the water. To fill a ballon you just attache it to the nozzle and push down on the yellow button to fill with water, slide it through the slot and tye it. Easy Peasy! The KAOS® Tie Not Filler is available at Walmart. Need to launch your water balloons farther? The KAOS® Cyclops will give you the advantage in the neighborhood water balloon fights, you place the balloon in the scoop and it will launch them up to 100ft! The handle is comfortable and gives you the perfect angle to launch the balloons and hit your target from quite a distance. The KAOS® Tie Not Filler and the KAOS® Cyclops come with 50 biodegradable KAOS water balloons so your ready to have some wet summer fun! KAOS® Cyclops is available at Kohls for $8.99 on sale and at Walmart. Get set for the warm spring and summer days with Imperial Toys, there is a wide variety of toys for girls and boys and all ages and you’ll be prepared for hours of outdoor fun! Connect with Imperial Toy on Facebook! This review was made possible by Mom Spark Media. Thoughts are my on. That stuff all looks super fun!!! And, glow in the dark bubbles?!? Who knew? I have never heard of this company! Thanks for the review! I so want the turbine…I mean my daughter does….he! he! I have been wanting to get my daughter a bubble gun and that turbine looks pretty sweet!! Price is awesome too! !